The lids have "Tupper Seal" on them and say made in France. 6 plastic lidded tumblers by Tupperware. 1 white, 1 yellow, 1 peach, 1 pink, 1 green and 1 blue. Used condition. Green one is worn around the top(see pics). 5 Vintage Tupperware Tumblers/Pots. Various sizes from 9-15cm high. From 5.5-7cm diameter. Condition is Used. Dispatched with Royal Mail 2nd Class. Tupperware Cutie Tumblers Set of 2 Green and Yellow 130 ml. - Made from polyethylene and polypropylene, these Tumblers from Tupperware are known for its superior quality and durability. - Ideal for carrying your favourite energy drink or milk shakes to work or to school. Two are in gold and one is in olive green. Well, dilly dally no more - the week has arrived. I have so much of it, I don't really know what to do with it all. You can see from the last two pics how much I managed to get on to my breakfast bar and there is double that lot again. Willy Tumbler The Container holds an ideal portion of 550 ml of food that can be organized neatly by the dividers. These dividers help keep food like rice and curry separate until they are ready to be eaten. IN CLEAN AND VERY GOOD CONDITION. Tupperware Cutie Plastic Tumblers with lids- 150 ML each - Set of 2 - New! So you can simply pop one in your lunch bag and carry it anywhere. This Tupperware set of 2 tumblers is made of a material that does not interfere with your food. Designed with a weighted base to prevent tipping. Tupperware Christmas Tumbler Set with color coordinated Flip Top Seals. 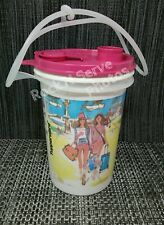 For sale is a Tupperware #109 bell tumbler with #1552 Sippy lid. I have been a collector for over a decade and will always one at heart. 11 oz Impressions Tumblers. GREEN & YELLOW. Previously Owned. Tupperware LOT of Assorted Kitchen Gadgets and Hostess Giveaway Prizes. Up for sale is a fantastic lot of 34 unused mini Tupperware hostess Party Give a Way Prizes. Total of 40 Pieces. Tupperware Disney Pixar Cars Lunch Set. (Red with Lightening McQueen character). (White Cup with Lightening McQueen & Mater Characters). Bell Tumbler with Red Sippy Lid. Tupperware Tabletop Stacking Tumblers. Teal Green Tumblers with Matching Seals. They are in the orange color with the sheer shaker flip top lids. Two of the lids are #634 with #639 flip top. But the third lid is an older style - #349-12. The flip top is attached to a ring which is around the shaker top. WORK GREAT WITH TUPPERWARE NON-LEAK TUMBLERS OR ANY OTHER TUMBLERS FUN DRINKS. THESE ARE A FUN PARTY FAVOR ITEM AS THE STRAWS WHISTLE! Tupperware Tumbler and Snack Cup Set. 1- Tumbler (16 oz.). with flip top spout. Tupperware Spring Tumbler Collection. Tall Straight Edge. 16 oz Capacity. Multi Color, Beautiful Coordinating Designs. 2 Tumbler with Flip Top Seal. MINI SHEERLY ELEGANT TUMBLERS. PLACECARD OR RECIPE CARD HOLDERS. Have 2 notches in them to hold a card. Blue Flip Top & Cariolier (Carrying Strap). Yellow Drink Container. All the lids fit nice and snug. Each is approx. Despite the flaws, these are great little containers for snacks, picnics, lunch boxes, etc.! The tumbler is the perfect size for little hands! Tupperware 'Citrus' Design Beverage Set. 4- Tumblers (16 oz. Capacity) with 4 Matching Seals. 1- 2 Qt Pitcher with Push Button Seal. #2412 ~ 12 OZ ~ 5 1/4"H X 3"D. 2 TABLETOP STACKING/NESTING TUMBLERS. Great for cabins, RVs, commuting, picnics or in your kitchen. 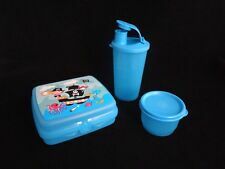 Tupperware Hello Kitty 2 pc lunch set. 16 oz tumbler with seal. The 1-16 oz has a "J" stamp. GOOD LUCK! Classic Sheer Tumblers with matching airtight Seals. Set includes: 4 each 12 OZ/ 355 ml. As Seen In Photo. 8 Vintage TUPPERWARE 5107A SHEER 9OZ-16 OZ. TUMBLERS With Seals. Includes: 4-16 ounce woth seal, 2-12 ounce with seals, 2-9 ounce with seals, all are in good preowned condition. Please see photos for details. Overall VERY clean condition, but they do show scuffs and signs of use like scratches. ONLY THESE THREE ARE AVAILABLE! 16oz Tumbler with round yellow seal. 4oz Snack cup set (3 pieces) with round yellow seals. THIS IS A NEW TUPPERWARE LUNCH 3 PC SET WHICH INCLUDES A SANDWICH KEEPER, A SNACK CUP AND A DRINK TUMBLER. A VERY FUN SET FOR ALL AGES. Stacking Tumblers with seal. 4 Classic Straight Sided Stacking Tumbler. FUCHSIA W/ PINK DRIPLESS STRAW SEAL. 24 INSULATED TUMBLER. Seal works properly. Pink - 109-36. Yellow - 109-37. Light Green - 109-37. Yellow - 109-41. Tupperware 24oz Pink Insulated Tumbler With A Dripless Straw Seal "No Straw"